If the nation and the world are to see a spiritual awakening, it will come as a result of people volunteering for missions, said Mickey Caison. Caison, adult volunteer mobilization team leader for the North American Mission Board, told a group of prospective mission volunteers at the Explore Conference at Oklahoma City, Quail Springs, Feb. 7, that there is a staggering need for people to link up with missionaries to reach the world. “Missionaries alone can’t do it,” Caison declared. 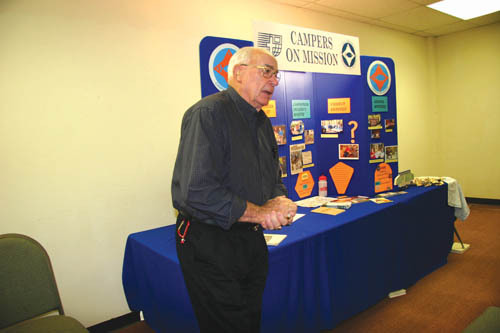 Caison, who was national director for disaster relief until 2001, now heads nine ministries. Conference participants were there to learn how they can be involved in missions, what avenues are available, how to get started and what kind of training is needed. They learned about volunteer mission opportunities at home and around the world, recreational missions, how women can be involved, student evangelism, how to share Christ in every mission situation, resort and leisure ministries, Falls Creek volunteer opportunities, volunteer builders, jail and prison ministries, church planting, who to engage in disaster relief ministries, sports missions, campus ministries and church renewal. Caison told the group there is a powerful example of what volunteers can do in the Book of Acts. “The New Testament church was an extraordinary church, but endured great persecution,” he pointed out. “We have no persecution, no boundaries, the opportunity of going anywhere we want and sharing the Gospel, yet Southern Baptist churches are plateauing or dying. He said many volunteers can relate to the unschooled, ordinary men described in the Bible. “They may not be scholars, but they can run a chain saw, or they can cook,” he said. He noted the people Jesus trained were men of compassion, men of conversation and men of commitment. Caison recalled how more than 1,000 volunteers stepped up to clean apartments at Ground Zero after the Sept. 11, 2001 attack in New York City. Caison said Jesus’ disciples heard his conversations—with Nicodemus, the woman at the well—and watched Him teach for hours. Jesus’ commitment never wavered, Caison said. Caison observed that it is hard to tell those inside the church from those outside. He acknowledged that sin does not seem to bother people today. He pointed out that when we are face to face with God, we see a lost world. “As a volunteer, you may be the one who goes into a community, provides the Word that sustains people, that gives them life,” he expressed. “You’ll always hear God say, ‘Who will go?’ If you are free of sin, you’ll say, ‘Here am I, send me.’ You’ve heard about ministry, how you can be involved. Are you the kind who is backing away or the kind who is terrified God is going to choose someone else? Randy Adams, church outreach team leader for the Baptist General Convention of Oklahoma, said people who God has used in incredible ways are those who sense they are living in critical times—not the end of time, but a critical moment.